Image Audit is the study of ‘hidden perception’. Every human being has some hidden perception, which normally is not revealed. For example, an employee has several hidden perception on their employer company or management and he does not want to reveal for his own reasons. How do you get to know what other people are feeling about you? Normally everybody tend to be frank and honest for revealing their mind when (1) they are in group and (2) they are asked to reveal anonymously. Image Audit is based on this principle. We discuss with the management and find out the issues to be studied. We design a questionnaire to suit the situation and test audit with few target sample. After finalising the questionnaire, we administer the questionnaire to the audience after assembling them together. Then we make them respond without indicating their identity. All the response sheets are pooled through a ballot box. In this process, we have found near 100 percent accuracy. We analyse the data and interpret properly. Interpretation is more important, otherwise, it may lead to a wrong conclusion. Finally, we make a report and submit to the Manager with our recommendations. Normally, when the data is analysed, we used to get a clear trend of perception uniformly. That trend indicates lot of things to the management. 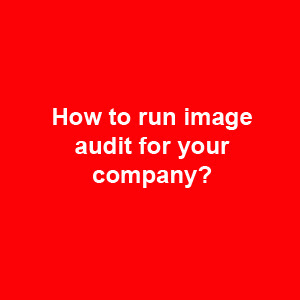 Through Image Audit, managements can understand the hidden perception of their stakeholders, particularly their own employees and plan suitable strategies. Also, it can forewarn crisis also. Image Audit will be helpful during crisis time. It can unearth the real root problems. More details and a live report is available at the Image Audit site. You can also listen to the corporate podcast here.